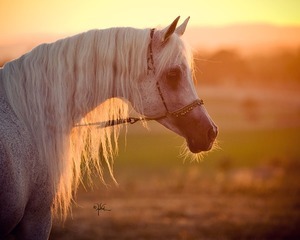 Sahbine was a graceful, grey mare of extraordinary courage and rare beauty that graced our lives for fourteen and one half years. This mare introduced us to many of the friends we have today who are firmly woven into the fabric of our lives. She taught us to celebrate the blessing of good times, laugh at equine antics and respect courage with dignity in the face of great pain. 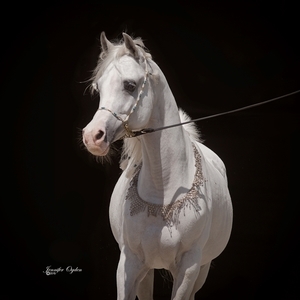 Sahbine was a lovely straight Egyptian mare out of our foundation mare Glorietasayonaara and sired by the world-famous stallion, Ruminaja Ali. Sayo was actually in foal with Sahbine when we purchased her from Judy and Charlie Jones, owners of Atallah Arabians. We watched her come into this world on February 2, 1990, one of the first foalings that we ever witnessed. Sahbine was special from the start and as she matured she exhibited many of the same qualities that I admired so much in her mother. She had the same regal character, the same lovely, dark eyes, wonderful movement and carriage. On February 9, 1998 Sahbine gave us her first foal, Shaboura, a lovely grey filly by the wonderful stallion PVA Kariim (Imperial Imdal x BKA Rakiisah), thus establishing the third generation of this mare family for Silver Maple Farm. Almost universally, whenever we have visitors to the farm and they saw Shaboura for the first time, they would stop in their tracks and ask, "Who is that!? ", and then exclaim, "What a gorgeous mare!" As Shaboura matured, she became more and more exotic. Sahbine's next foal was the grey colt, Silvercloud by BB Thee Renegade (Thee Desperado x PH Safina), foaled on April 6, 1999. As a youngster, Silvercloud was a handsome colt with outstanding athletic ability. He was gelded as a yearling and was sold as a family horse. On May 1, 2004 , we were blessed to have a filly born out of Sahbine, via embryo transfer, sired by *Simeon Shai+. 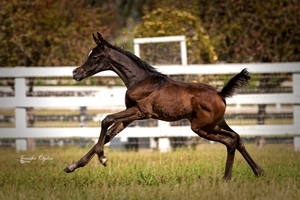 This little filly was nothing short of a miracle baby, having been born to a lovely recipient mare that had colic surgery just two weeks prior to giving birth. The filly, that we named Sahbrina SMF was born three weeks early and is now a mature mare. In her last year Sahbine really struggled. And, as we monitored her daily, we could see her declining. There was still a brightness in her eye, but her health was suffering. As Henry and I considered the possibility of yet another surgery for Sahbine in order to try to help her, we made the very difficult but the right decision, to let her go. It was in our opinions the kindest thing we could do for our beloved equine friend. Sahbine may have left us physically but her spirit will remain forever in our hearts and lives on at SMF in the legacy of her get and grandget.